The Canadian Coast Guard Auxiliary awarded medals to eight of its volunteer rescuers and to one member of the Canadian Coast Guard. The recipients are: Charles Roberts of St. John´s, Administrative Excellence Medal; Aubrey Wells of Fortune, Arthur Pierce of Harbour Breton, Rodney Pierce of Harbour Breton and Wesley Snook Sr. of Harbour Breton, Operational Merit Medal; Winston Pitcher of Burin Bay Arm and Harry Strong of Old Perlican, Leadership Medal; Herbert Pittman of Englee, Nfld. and Steve Daoust of Prescott, Ontario, Exemplary Service Medal. 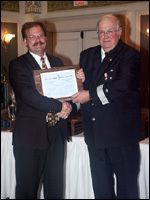 M. Daoust was also presented with a Commendation by the Commissioner of the Coast Guard, Mr. John Adams. Medals were presented during an Award Ceremony that concluded the CCGA Newfoundland annual Search and Rescue (SAR) Competition held on October 19 in Marystown.